To many of us in Seattle, January is just a month to get through. The days are short, the light is dim. Gray surrounds us everywhere we look: low clouds fill the sky, tree branches wring their bare, barky fingers, and people bundle up in dark wool or Gortex as we venture forth into bad weather. Our version of cold doesn’t bite with the clean, sharp air of winter; it slobbers with drizzle and rain. To birds, though, January is a time for romance. The vast flocks of ducks that fill our waters are all coming into their breeding plumage now, looking like newly polished jewels. The Bald Eagles have begun to bring more sticks to their nest at nearby Talaris, and the female is working hard to build herself up for the great task of making two eggs. The male helps her by catching food and laying it at her feet, the eagle equivalent of dinner for two at Palisade’s. Yesterday, the Red-tailed Hawk pair who have claimed the Fill as their territory decided to join in. 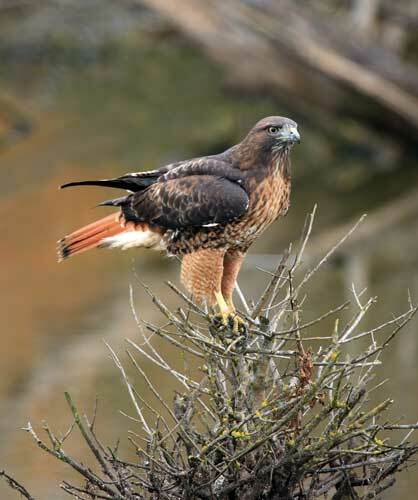 The female—the larger of the two—was minding her own business, perched on a cottonwood branch overlooking Sidles Swamp. She was studying the land below, looking for an unwary rat, when the male came winging in from the west. He threaded his way through the trees to reach her perch and landed on the same branch but some distance away. The female paid no attention. She was looking south, the male faced north. Time passed. Then the male took one sidling step toward her and began gazing at the sky. More time passed. He took another step and scanned the swamp too, as though intent on finding his own rat. No rats coming into view after several minutes of scanning, the male took one last step and leaned over to brush against the female. She turned her head to gaze at him over her shoulder. “Oh, you here?” she seemed to ask. She turned around to join him side by side, and their bills briefly touched. If she had had lips, I think she would have been smiling. I certainly was. As a female myself, I had to admire her performance—and his persistence. This entry was posted in Uncategorized on January 10, 2011 by constancesidles.